Due to popular demand, Dig Right In is now offering its Earth’s Original™ Compost Tea to residents for DIY soil feeding applications to lawns and gardens. You must be ready to apply the tea within FOUR HOURS of picking it up. Roughly measure the square footage of the lawn and/or gardens you want to apply to. Keep the lawn square footage separate from the garden square footage. Email customerservice@digrightin.com or call 708-485-1234 us before 4pm on the Wednesday before. Earth’s Original Compost Tea is sold at $6.00 per gallon. 5-gallon buckets with lids are available for an additional $11.00 per bucket (Hint: you can purchase them for about half that cost at any home center store). You can pick up the brew on Saturdays this summer (May 19 : June 23 : July 21 : August 18 : September 15) between 9:00 a.m. and 1:00 p.m. at our office located at 9900 Derby Lane, Westchester, IL. We will fill 5-gallon buckets with 4 gallons of tea, 1-gallon jugs with 1-gallon of tea. Make sure your containers are clean and did not previously contain any chemicals, pesticides or bleach. This is all organic, you know! Cash, check or credit cards accepted. So, if you’re ready to feed your soil to feed your plants, measure your yard and order your compost tea today! We will provide you with written application instructions, so you don’t have to memorize the following. However, and VERY IMPORTANT!!!! You must be ready to apply the tea within FOUR HOURS of picking it up. This is because the highly concentrated liquid of live, complete soil food web organisms will not survive “on the shelf”, which is why REAL compost tea is not available in stores. Pour your tea into a watering can or a 5-gallon or 3-gallon sprayer. Ideally the watering can has a “showering” type head. Do not dilute with water. For lawns, roughly walk out a 500-square-foot area and spray one gallon to that area. This will give you the 2-gallons per 1,000-square-feet application rate. For gardens, roughly walk out an 8-foot by 4-foot area (which is 32 square feet) and liberally apply tea to the soil and leaves. Foliar feeding is a great way to fight fungal issues (like powdery mildew) affecting many vegetables and perennial plants. Try to avoid spraying any immediately ready-to-pick vegetables, but if you do, simply wash before eating (which you should be doing as a safe-food-handling practice anyway). Watering can with shower nozzle (left), five-gallon backpack sprayer (center), and three-gallon sprayer (right). These are the best ways to apply compost tea, and you’ll need to have these on hand before you purchase your compost tea. A typical residential lot has about 2,000 square feet of lawn. Most vegetable gardeners have about three 8-foot by 4-foot beds for a total of 96 square feet. Thus, you would want 3.7 gallons for the lawn and 1.5 gallons for the veggie beds. We’ll round this to 5 gallons total. You’ll let us know if you need to purchase 4-gallon buckets. In this example you will need two. Your costs will be $33.00 for the tea and handling, plus $22.00 for two buckets for a total of $55.00. 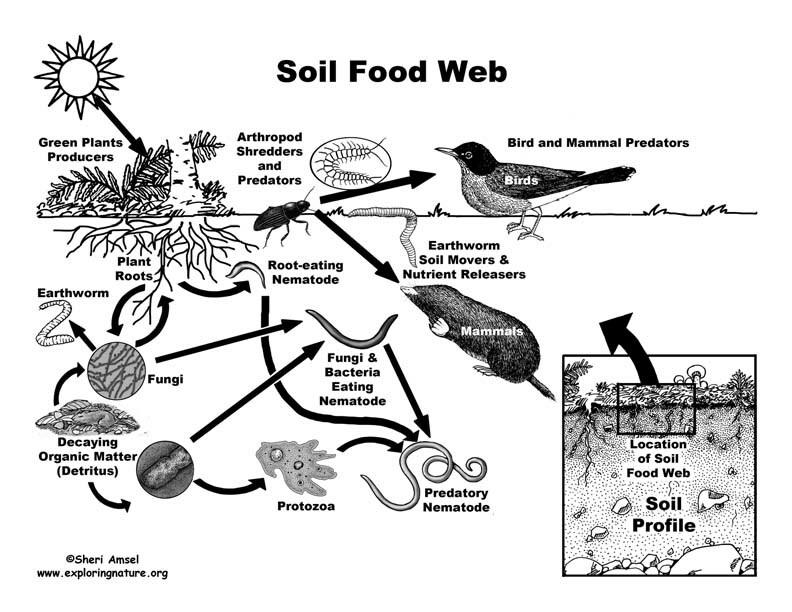 Our 100% organic compost tea is full of beneficial soil micro-organisms that make up the soil food web. This brings biodiversity to your soil, and feeds your soil to feed your plants—exactly as nature intended! No artificial chemicals to expose to your family, pets and nature, so it’s the healthiest way to maintain your yard. Come see how we make our tea and learn all about it. Sounds like a lot to do by yourself? Ask us about how you can sign up for Dig Right In to treat your lawns and gardens using our complete Back-to-Nature™ organic lawn care program, which includes three tea applications per season. So, if you’re ready to feed your soil to feed your plants, measure your yard and order your compost tea today!